The CustodyWare solution allows a designated Transfer Agent to act as custodian of an investor's blockchain assets. The investor nominates the Transfer Agent and signs a blockchain transaction to give the Transfer Agent control of their holdings. On instruction from the investor, Transfer Agents can execute token transfers. All transactions are signed by the Transfer Agent and are transparently and immutably stored on the Ethereum Blockchain. The cryptographic assets remain the property of the investor, however appointing a Transfer Agent allows the investor to securely manage their holding. Impersonation of the investor or the Transfer Agent is prevented as all transactions need to be cryptographically signed by the transfer agent. CustodyWare allows Transfer agents to manage blockchain holdings on behalf of their clients reducing duplication and ensuring safe transparent custodianship of assets. We provide a compliant PIN secured hard drive to indefinitely store your gathered client data in accordance with SEC regulations. We host and manage everything, using the latest in Azure cloud services and iOS and Android app provisioning. Sit back, relax and concentrate on your business, not IT! We constantly monitor our deployed services and are ready to take you call to support your CustodyWare journey. Trusteeship business processes for long term holds and release of ownership. CustodyWare provides a user signature guarantee of the transfer of custody of blockchain assets to the Transfer Agent. An unalterable record of this custody transfer is stored on the Ethereum Blockchain. Users are protected by a verifiable chain of trust between them and the Transfer Agent. The institution is protected by proof that KYC/AML checks have been performed - these checks are notarized on the blockchain. 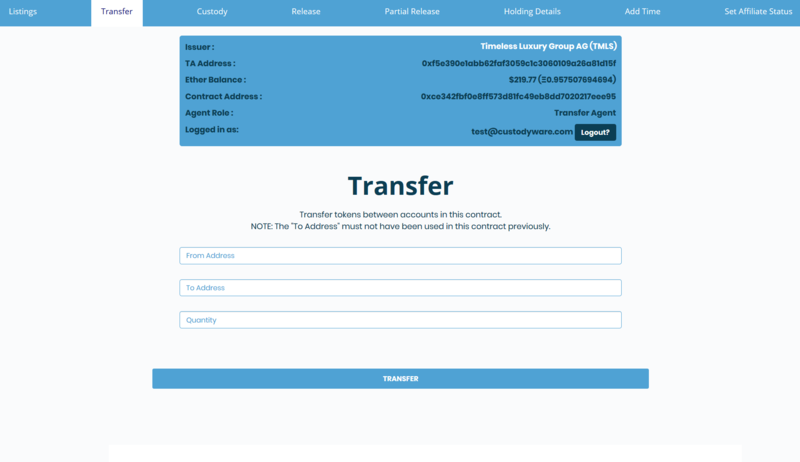 All transfer agent actions are signed on the blockchain providing a decentralized permanent record of all actions. Click above browse through our demonstration software. Contact us below and we can provide you with sample accounts to explore the full functionality of CustodyWare.